"Baingan Bharta" or "Baingan Bhurtah" is a popular North Indian dish. 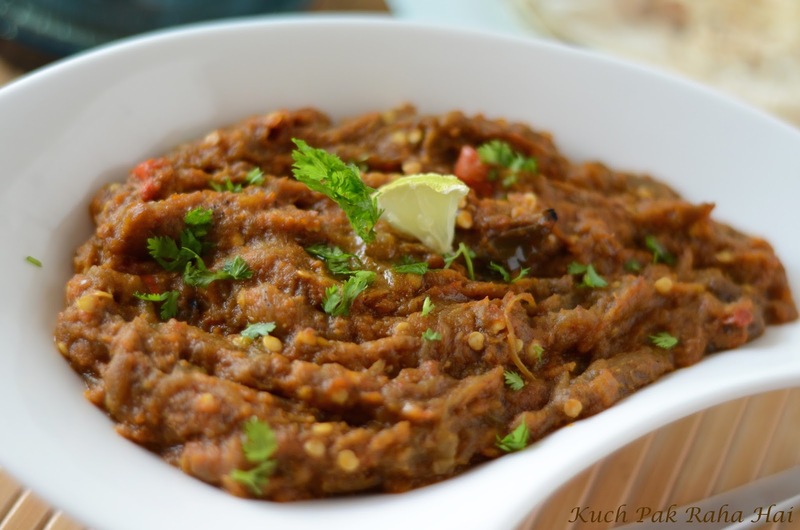 The vegetable "Baingan" (as called in Hindi) is known by many other names like Brinjal, Aubergine or Eggplant. It comes in variety of shapes (round, elongated, oval etc ) and sizes. The colour of the vegetable varies from white, green to dark purple with fleshy insides. Brinjal is packed with goodness of dietary fibre, phytonutrients and Vitamin K.
The "Baingan" we would be using for this recipe would be large one with dark purple covering. 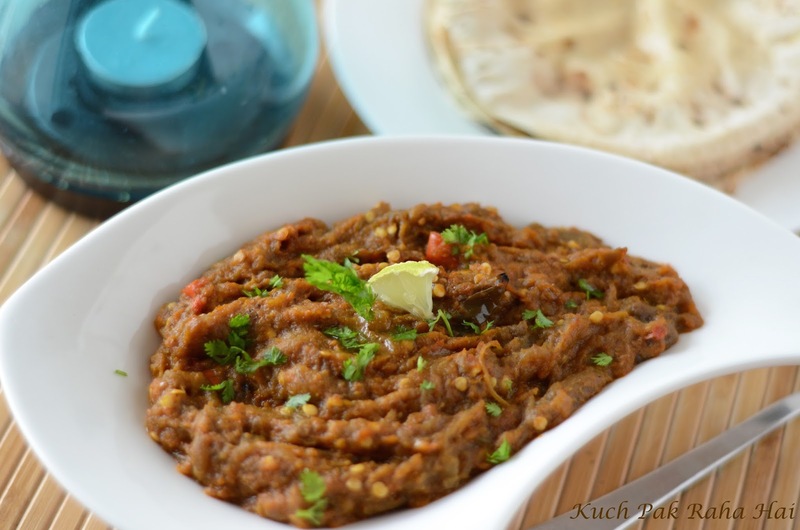 For preparing this dish, Roasted Brinjals are peeled, mashed and mixed with variety of spices. Roasting the Baingan gives it a nice smokey flavour. Traditionally this was done on Tandoor to incorporate the smoke of charcoal in baingan to impart an overall rustic aroma and taste to the dish but since in modern days tandoor is so uncommon we would perform this step directly on flame. 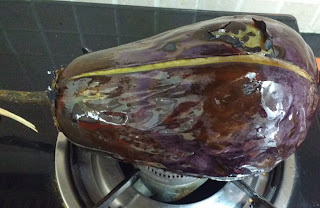 Wash the brinjal under running water. Wipe it with a kitchen towel. Slit it into 4 pieces. 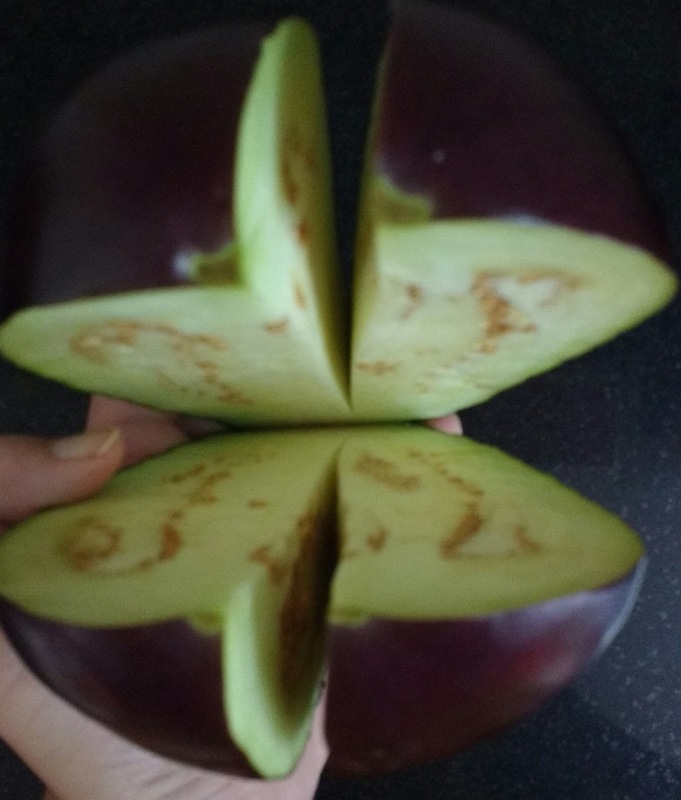 Take care not to slit till the base. It is done just to check for any worms inside. Rub some mustard oil over it. 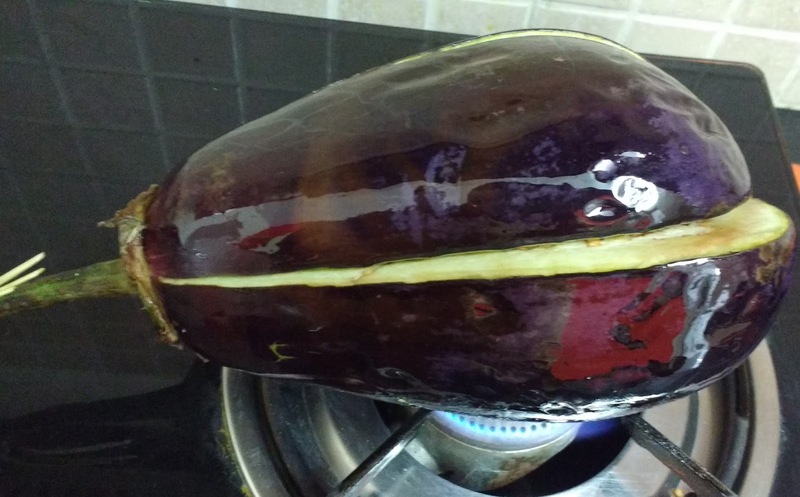 Switch on the flame and start rotating the oiled brinjal over it. 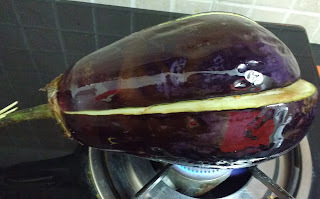 On Medium-low flame keep rotating the brinjal till its peel starts burning off from here and there. Dip the grilled brinjal in a bowl of water and peel it. 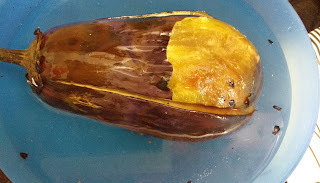 Dipping in water helps in fastening the peeling process. 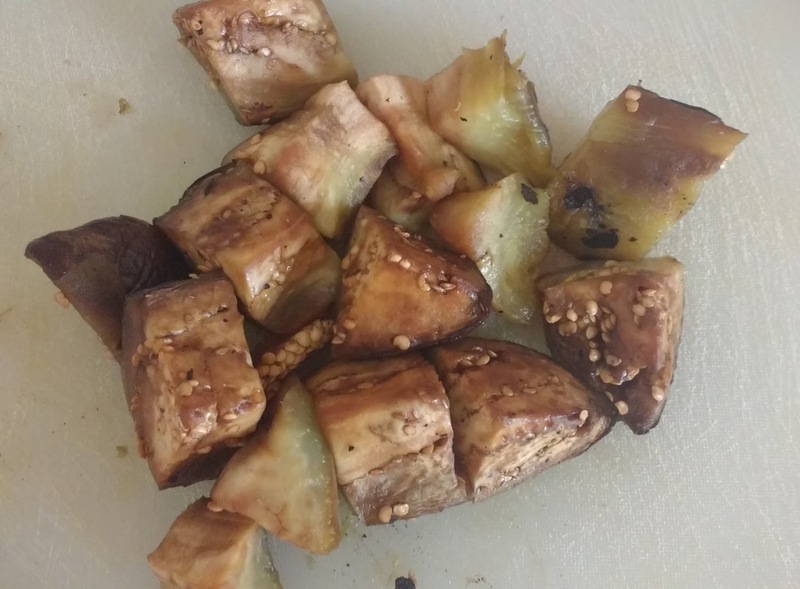 Chop the peeled brinjal into square pieces. 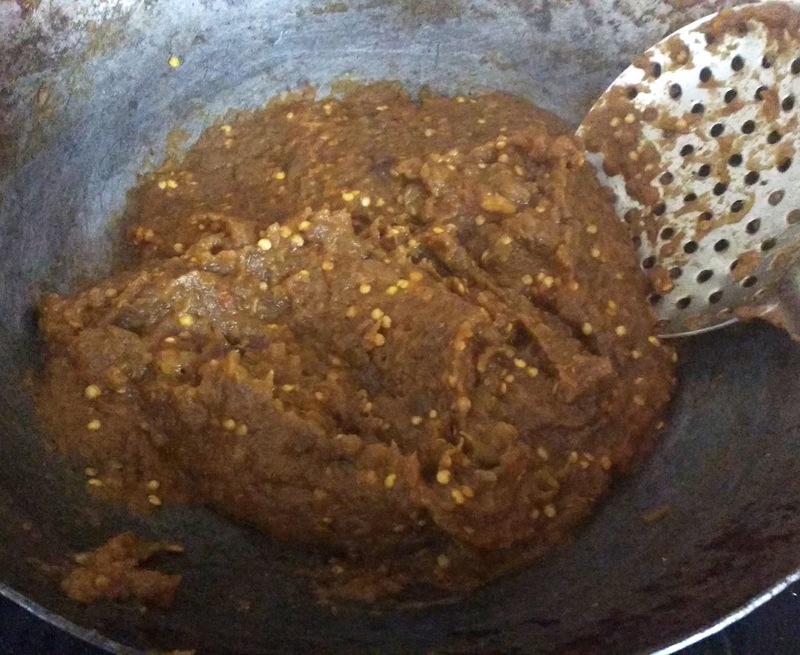 Take a heavy bottomed pan or "Kadhai" and heat mustard oil in it. 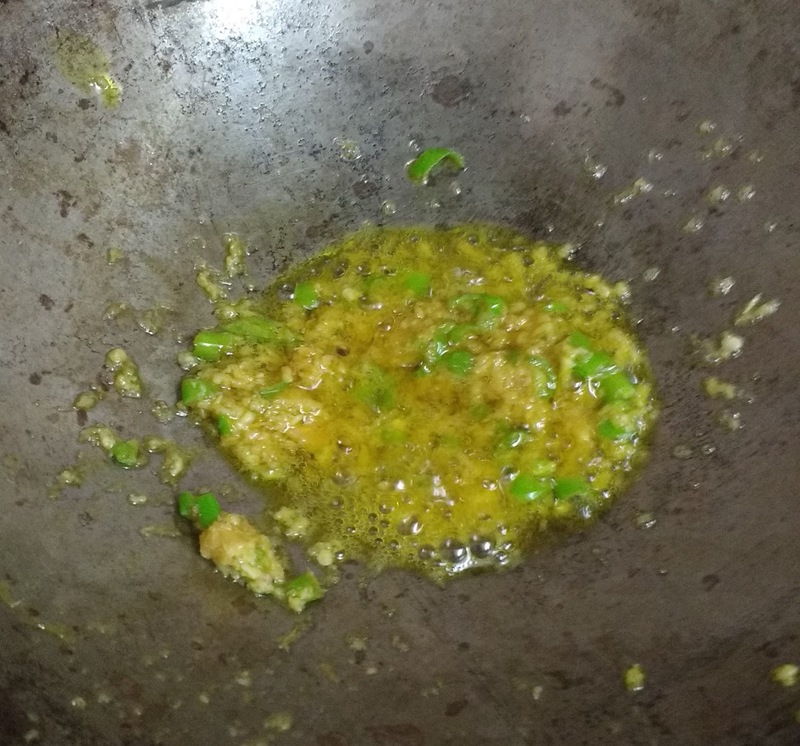 Add ginger, garlic paste and chopped green chillies. Stir well for few seconds. Add finely chopped onions and stir fry it till it becomes golden in colour. Add finely chopped tomatoes and let it cook till they are soft and mushy. Add chopped brinjal pieces and half a cup of water. 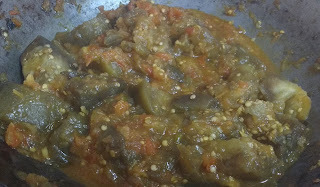 Cover it with a lid and let it cook on slow flame for approx 10 minutes till you are able to mash the brinjal with spoon. 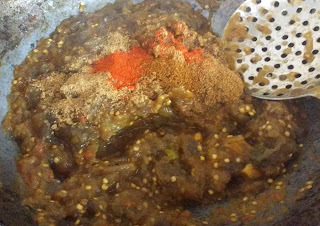 Add all the spices and mix it well such that all the spices are completely blended with brinjal mash. 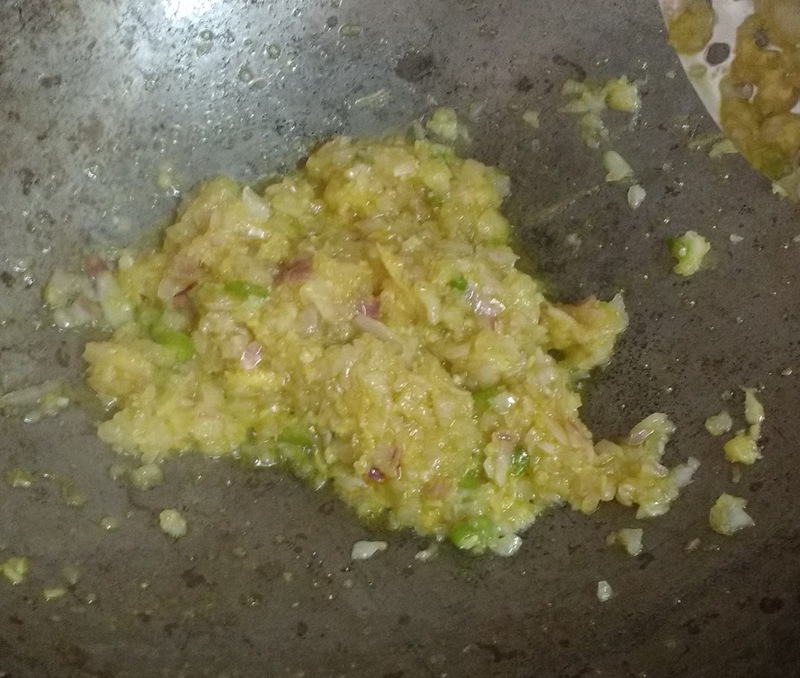 Add ghee to it. 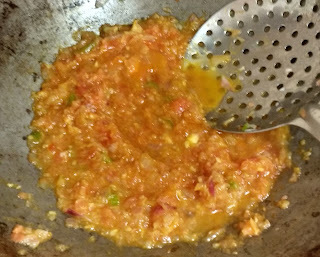 Keep stirring the bharta till it becomes glossy on the top and slight oil separates from it. Garnish with some chopped coriander, green chillies or a lemon wedge. Enjoy with fresh hot chapatis! !